vehicles in stock at their Long Island Dealership. 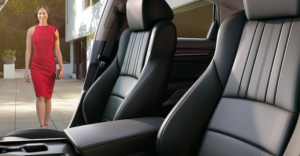 Plush Leather-Trimmed Seating features elegant stitching and top-notch craftsmanship that help make every drive more comfortable and enjoyable. Wet shoes? No problem. All-Season Floor Mats act as a protective layer between nature and your original carpets. simplifying access to the information you need. The all-new Accord delivers safety and driver-assistive technology standard with a seriously fun, refined and fuel-efficient driving experience.